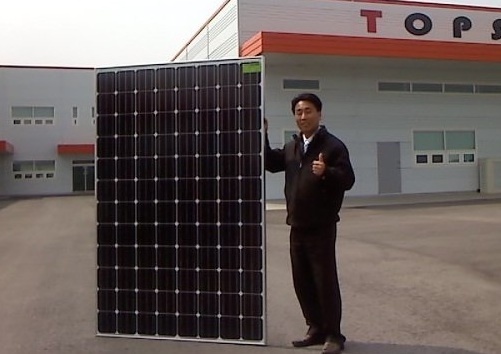 Home > Solar Panels > Solar Panel Size: Is Bigger Better? Solar Panel Size: Is Bigger Better? The Size of Solar panels is definitely increasing, there’s no denying it. If anyone has ever spotted any of these monsters on an Aussie roof, please send in some snaps! If you go to my solar panel comparison tool and sort by size, you’ll see some more super sized solar panels accredited for use in Australia. What size of solar panel do I need? I’ve been offered a system with 190W panels and another mob is offering 250W panels. Is bigger better? You get a slightly better Watts per m ² because you have more solar cells and less aluminium framing. So you should be able to fit a slightly bigger system on your roof. Fewer panels are used for the same sized system, so there are fewer electrical connections, which in theory means a more reliable system. Fewer panels means a slightly quicker install. Fewer panels means less racking, framing and fasteners, so less embodied energy in your solar system. Larger panels tend to be newer stock than the older panels, from more modern production lines. They can constrict your system design in terms of where they will fit. They can constrict design as to how they are wired up because they each produce so many volts. They are heavier and potentially more dangerous to install on a roof. If one fails out of warranty it is going to be more expensive to replace. So generally speaking, all else being equal, the larger panels (240W+) would be my preference. But if you are being asked to pay a big premium for the privilege of bigger panels, you may as well go with the smaller ones, as they should produce just as much power. Doesn”t less panels mean less conections means less losses. Ive seen a 3.2 kw Topsun system pushing out up to 4kw dc per hour in summer. Yes – but the losses in a connection are tiny. I’d like to see the data for that system – it looks unlikely to me! Just wondering what sort of cost each panel is? Our bills have been astronomical recently (reaching $2,000 on occasion) so if we can reduce the our load by generating at least *some* of our own power we’d be *very* pleased. Panels at the moment cost from $0.60 to $0.95 per Watt. I have a 3kw system with 12, 250w panels, can I add 2 more 250w panels to my existing system, there is room on my roof? Will it void my 44c , I live in QLD? With a 3 kilowatt inverter you could add three 250 watt panels and remain below the limit, so adding 2 more is not a problem. so in theory…..if they put out the same values isn’t it better to go for the smaller one as its safer to install,needs less surface area to do the same and is less likely to get hit by hail due to the smaller size and is a bit cheaper also? and if so, then it should in theory be cheaper and more efficient to buy 2 of them and connect them in parallel to have a higher mAh output?…….but will it affect the Watt output whether it is connected in serie or parallel ? 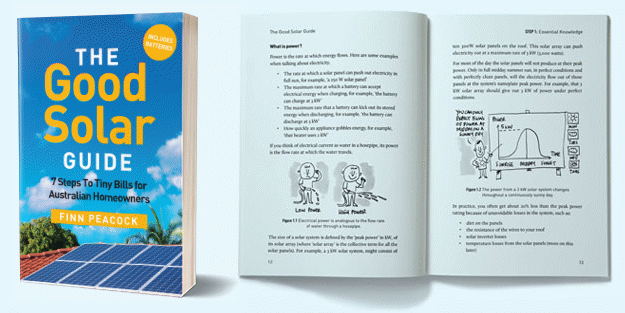 its just another part of my research before making my final decision if it is really worth it to go solar inverter in case of power failures and maybe to run a few things during the day to save a buck or two on the electric bill or something like that…. Thanks for your time and help…. The smaller, more efficient panel does seem a better deal. Two identical panels will produce twice as many watts as one whether they are wired in series or parallel. If you wire them in parallel the voltage will remain the same as for one panel while the amps will double. And if you wire them in series you will double the voltage while the amps will remain the same. so will the Wattage just be added together weather the layout is series or parallel?? as if i put the 2 in series it will be 24 volts but 3 amps but in parallel it will be 12 volts 6 amps ….im just not sure how wattage works weather its in series or parallel or do they add up no matter the configuration?? Watts equals amps multiplied by volts. So if you have two panels you will double the wattage whether they are connected in parallel or series. It is certainly possible. There are a number of solar carports around and you may be able to find something commercially that will suit your needs, although I can’t think of any particular ones off the top of my head. If you are thinking of an enclosed structure I’ll mention that solar panels can get very hot, but generally not as hot as a plain tin roof on account of a portion of the sunlight energy is converted into electricity. I have been quoted REC TP2 S panels for my home. Another supplier says these are commercial panels and not suitable because they are too big/heavy and may cause warranty probs. REC literature refers to them as commercial but I can’t find anything that says using them residentially is an issue. What do you think? REC TwinPeak 2S 72 panels are commercial panels. They can still work with a residential inverter but it is possible their warranty may not cover residential use so that will need to be checked. If the warranty does apply the manufacturer may still not honor warranty claims if they are not clamped to the roof rails correctly. This can happen because these larger 72 cell panels can need to be clamped differently from 60 cell panels. According to their datasheet they can come in 1,000 volt versions, which is normal for residential use, rather than the 1,500 volts that is usual for large scale commercial systems. I recommend being very cautious about having 72 cell panels installed. Some less reputable installers may use them simply because they cost slightly less per watt without making allowances for the fact they may need to be installed differently.